Matson, Inc. (formerly known as Matson Navigation Company), is a public shipping company which was founded in 1882. 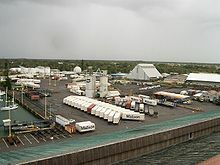 The company provides shipping services Pacific-wide, mainly to and from the Hawaiian islands. Matson is credited with introducing mass tourism to Hawaii with the opening of the historic Moana Hotel (now known as the Moana Surfrider Hotel) and the Royal Hawaiian Hotel in Waikiki on the island of Oahu. William Matson (1849–1917) was the founder of the Matson Navigation Company. He was born in Lysekil in Västra Götaland County, Sweden, and orphaned during childhood. He arrived in San Francisco after a trip around Cape Horn in 1867. Working aboard the Spreckels family yacht, he struck up a friendship with tycoon Claus Spreckels, who financed many of Matson's new ships. In 1882 the three-masted schooner Emma Claudina ran to the Hawaiian Islands. The enterprise began in the carrying of merchandise, especially of plantation stores, to the islands and returning with cargoes of sugar. This led to gradually expanding interests at both ends of the line. Increased commerce brought a corresponding interest in Hawaii as a tourist attraction, which soon prompted the construction of the Moana Hotel in 1901. More steamships continued to join the fleet. When Captain Matson died in 1917, the Matson fleet comprised 14 of the largest, fastest and most modern ships in the Pacific passenger-freight service. The decade from the mid-1920s to the mid-1930s marked a significant period of Matson expansion. In 1925, the company established Matson Terminals, Inc., a wholly owned subsidiary, to perform stevedoring and terminal services for its fleet. With increasing passenger traffic to Hawaiʻi, Matson built a world-class luxury liner, the Malolo, in 1927. At the time, Malolo was the fastest ship in the Pacific, cruising at 22 knots (41 km/h). Its success led to the building of the luxury liners Mariposa, Monterey and Lurline between 1930 and 1932. Matson's famed "white ships" were instrumental in the development of tourism in Hawaii. In addition, the Royal Hawaiian Hotel and Moana Hotel on Waikiki, which Matson purchased out of bankruptcy in 1932, provided tourists with luxury accommodations both ashore and afloat. To generate excitement and allure for Hawaii as a world-class tourist destination, Matson developed an ambitious and enduring advertising campaign that involved the creative efforts of famous photographers such as Edward Steichen and Anton Bruehl. In addition, Matson commissioned artists to design memorable keepsake menus for the voyages, as well as during their stay at the Royal Hawaiian. During this period, Matson built a luxurious headquarters at 215 Market Street in San Francisco; notably, it featured an observation tower and cupola at the northern corner of the building that enabled company executives to see its ships coming through the Golden Gate. The company later sold the building to Pacific Gas and Electric Company, whose General Office was next door at 245 Market. PG&E has incorporated the former Matson building into its General Office complex, keeping Matson-specific details such as elevator doors with detailed maps of Hawaii on them. For a brief period after World War II, Matson operated a luxurious airline using Douglas DC-4 aircraft between the Pacific Coast and Hawaii. The airline ultimately ceased operations because of political pressure from Pan American World Airways, which resulted in inability to obtain federal government scheduled operating authority. In September 1967, Matson's ship Pacific Trader inaugurated container service between Far East and US West Coast. Today, Matson continues to ship cargo across the Pacific and plays a key role in the economy of Hawaii, the West Coast and the trading of goods from east to west. On December 1, 2011, Matson's then-parent company Alexander & Baldwin announced that its board of directors approved a plan to split A&B and Matson into two separate companies. As part of the plan, Matson would leave Oakland, California to become a Honolulu-based company. The two companies are now traded separately. In 2015 Matson, Inc. acquired Horizon Lines, formerly its main competitor in the United States domestic market, for $469 million. In 2013, Matson ordered two new freighters of the Aloha class, followed in 2016 by an order for two Kanaloa class vessels. Primarily a conveyor of cargo, Matson also introduced into service a number of passenger liners to capitalize on the burgeoning tourist trade. In 1926 Matson took over the Oceanic Steamship Company, operating three trans-Pacific liners, including Sonoma. From the early 20th century through the 1970s, Matson liners sailed from the west coast ports of San Francisco and Los Angeles to Honolulu and points beyond, including a handful of South Pacific ports of call as well as Sydney, Australia and Auckland, New Zealand. Two of their earlier cargo liners, Maui and Wilhelmina, were the first passenger ships to place their engines aft. Among the "white ships of Matson" were Malolo (rechristened Matsonia), Lurline, Mariposa and Monterey. With the advent and expansion of routine air travel between the mainland and the islands, Matson's passenger service was greatly diminished and the liners were eventually retired from trans-Pacific service and virtually gone by the end of the 1970s. ... this pair of Matson-Horizon containers, left long time in the Walmart plaza. ^ "Company profile Matson, Inc". Businessweek. Retrieved 14 March 2013. ^ "Matson: Hawaiian Shipping Spin-Off Offers Good Prospects". Seeking Alpha. Retrieved 7 March 2013. ^ Hans van Ham; J. C. van Ham; Joan Rijsenbrij (2012). Development of Containerization: Success Through Vision, Drive and Technology. IOS Press. pp. 61–. ISBN 978-1-61499-146-5. ^ Schwing, Emily (5 June 2015). "With Matson acquisition final, Horizon Lines no longer exists". KTOO. Juneau, United States. Retrieved 5 June 2015. ^ "Matson to name new ship after Sen. Dan Inouye". Honolulu Star Advertiser. 6 November 2013. Retrieved 28 October 2018. ^ "Matson orders two new conro ships". American Shipper. August 26, 2016. Retrieved April 5, 2018. ^ "History of the Matson Fleet". Matson Navigation Company. Cushing, John E (1951). Captain William Matson (1849–1917): From Handy Boy to Shipowner. New York: Newcomen Society in North America. OCLC 654333478. O'Brien, Duncan (2008). The White Ships: Matson Line to Hawaii, New Zealand, Australia Via Samoa, Fiji, 1927–1978. Pier 19 Media. ISBN 978-0-968-67341-6. Wikimedia Commons has media related to Matson, Inc..